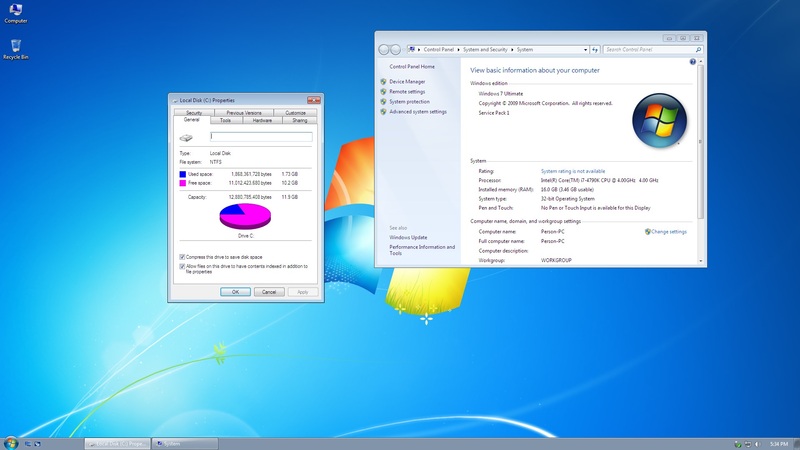 Windows 7 32-bit just does not allocate and does not use RAM above 4GB address. Drivers on Windows 7 32-bit can read and write above 4GB address. If you map 3.9GB, it can be allocated below 4GB address, so the remaining available RAM below 4GB address is too small. You may try adding "--top" option to your "map --mem" command for 3.9GB disk image. This tells GRUB4DOS to allocate at highest available address. Virtual disk size >= 4GB should not have this problem because it will not fit in lower region. You can read size of available memory range in GRUB4DOS by using displaymem command. It is displayed in hexadecimal. The biggest block can be "slightly" larger than (total RAM - 4 GB) if your motherboard support "memory remap" and it is enabled in BIOS. I think max size of virtual disk (in VHD) that can be loaded in contiguous memory space is ((size of biggest available block above 4GB address) - 1MB). Max virtual disk size that can be loaded on this machine is approximately 4597MB (which is slightly less than 4.5GB). The connotative meaning of --top has changed since last year. With newer versions (of grub4dos 0.4.6 series), --top is now a switch for "enable memory blocks above 4GB physical address". And "map" will always find (look for) blocks from top to bottom. Without --top, map only find blocks below 4G address limit (i.e., 32-bit address limit). With --top, map can find all blocks, including blocks above the 4G limit. This change is made basically for WinVblock. Note that WinVblock does not support blocks above 4G limit. Also note that yes, firadisk does support blocks above 4G limit. I do not know if you run into a limitation of VHD_W7_Compact but you can create a 3900MB VHD (32 bit Win 7 OS) on a comp with 8GB of ram. I made a 12 GB .vhd (32 bit Win 7 OS) copied to ram on a comp that has 16 gb of ram. After reading that I too made a Win7 32b in a 4.25GB VHD. It boots and runs OK from memory. edit : I'm using the PAE patch. - the vhd can load only above the memory hole. - the vhd is not (always) loaded at the lowest memory - rather it is loaded at the first block on memory large enuf to hold the vhd. - windows 32b is somehow able to map the addresses above 4GB so that 32b programs run OK. But after reading posts by karyonix and tinybit, it looks like I'm wrong. EDIT : Also since the lower memory (below the memory hole) is not used to load the vhd (see #65), maybe after windows starts running the free memory it sees and uses is that lower memory (it will be below 4GB). Now, Its not very clear to me as to how there is a difference in the amount of available RAM in the two trials. Is there a way to check in Windows the memory address ranges where Grub4Dos loads the VHD ? Steve's comments there indicate towards System Board in device manager. How do i interpret them ? If you use a newer grub4dos version in 2018, you have to use the --top option, or else map will fail because there is no suitable blocks below the 4G address limit. I have a computer running Windows 8.1 in UEFI mode and I would like to use this computer as well to boot Windows 7 from Ramdisk. As far as I know, Grub4dos does not work on UEFI and hence Ram booting from FIradisk is not possible. Any ideas or clues on how to boot and run Windows 7 from RAM on a system with UEFI enabled ? Using BootIce you can edit UEFI BCD to boot a VHD or a boot.wim, so try this approach. Any post or tutorial on this ? From what I understand, I need to capture the installed Windows 7 to a wim file which can then be booted from RAM (without Firadisk/Grub4Dos) by adding an entry in the UEFI BCD. Those links you are posting are for Windows wimboot wich is booting from a compressed (.wim or .esd) image using wofadk.sys, first used on 8.1 update 1, but using WinNTSetup can be also applied to win7. You are not booting in RAM, you are booting an instaled OS (on a partition or a VHD) that has almost all its content as links to the image (.wim or .esd) contained somewhere on your (internal or external) HD, this approach has the tendency to grow up a lot, every time you add something, as all added is not compacted + the size of the original image (.wim or .esd). Another approach is make an small VHD NTFS compressed wich will not grow up so much as all you add will be also NTFS compresed. I think this is more convenient, in fact I have a W864ESP1.vhd (expandable) wich is 3.90 GB, including SoftMaker Office 2016. I suggest you to use Win7 ultimate or Win8.1U1 (both do not require Firadisk), and can boot directly from windows BCD. Does your W864ESP1.vhd boot from RAM or are you referring to the regular native VHD boot ? how long need the boot ? over 2 minutes to move in the ram.. holy crying cat ..
And XP (this is Firadisk and grub4dos bootable), but from XP vhd only keept the Ghost image just in case I need it some day. My VHD's are MBR formated not GPT, so for booting in UEFI machines I disable segure boot and enable csm boot. I added some images of BCD (BootIce easy mode) to let you see how is BCD for each one (7 & 8.1). I think to make this VHD's RAM bootables only thing required is SDI File for each one, and change BCD to RAM Boot. But so far haven't try this as I prefer native boot wich is faster and keep changes. I have accomplished this on a computer running Windows 7 on a MBR disk with UEFI disabled. What I am looking for is a similar solution, except that in this case the other computer is running Win 8.1 in UEFI with secure boot. Turning off Secure boot or UEFI is not an option; hence RAM booting using Grub4dos and FIradisk is not possible. I will look into the SDI file and BCD Ram boot approach. Any more pointers on the SDI file approach will be helpful. Well let me tell you something my friend, I don't think you can find a way to avoid turning off Secure boot. I have several years looking for it and haven't found it yet. I want just to remember you when UEFI booting you need to edit the UEFI BCD. Just want you guys to know that windows 8.1x86 also works. The only strange thing is it does not show the succesfully installed ramdisk. It does not give a notification it just works it also means that it doesn't ask you to reboot. That is what i really like about it. Ps. i made it a 12 GB ramdik version. Edited by blackbalfur, 27 April 2018 - 03:13 PM. To avoid the reboot popup this is what I do. Boot W7 from memory, run IMG_XP_Update.exe (I use the version from IMG_XP_74), select the VHD and only check "Total update including ...". Restart and boot from filedisk, select "Boot normally" when asked, after booting delete folder Windows\ERDNT to save space. Defrag, maybe. EDIT : Not sure of this : it worked with imdiskinst 1.8.4.exe installed, but not when imdiskinst 2.0.9.exe was installed. The amount of space the os takes up on first boot is not in relation with the amount of space the os can take up in this setup. My point was to prove you can make a 12 gb .vhd and load it into ram if you have 16 gb of ram. So your ram os can have all kind of software installed to because of the 12 gb size. Edited by blackbalfur, 15 October 2018 - 04:16 PM.